There are RV must haves that you need to be able to travel safely and comfortably in an RV. 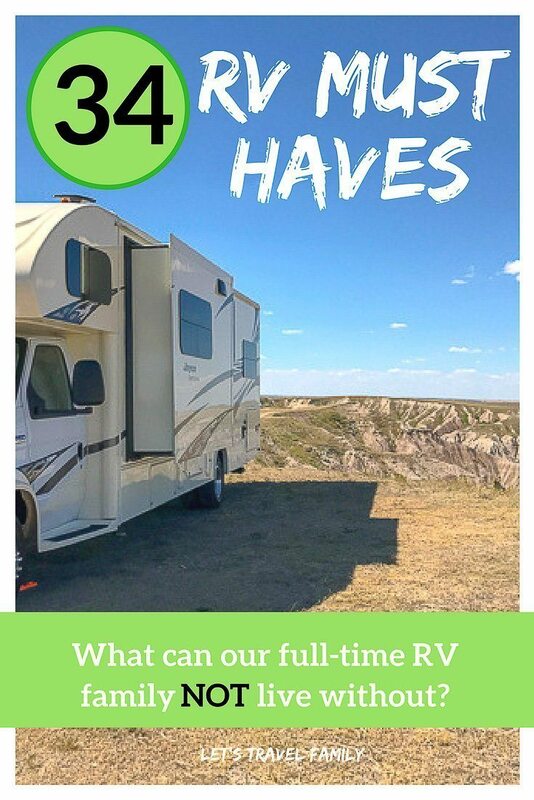 Camping, RV travel, cooking, and internet connections are just a few of the things we touch on while going through a list of 34 RV must haves. We hit the road to travel as a full-time RV living family back in 2017, so we also include a few ideas that will help digital nomads who want to travel in RVs. We include our top suggestions of the best RV accessories! These are items we highly recommend for all types of RVs including a travel trailer, motorhome, fifth wheel and any other type of RV living or camping. Some, you can do without for the first few days or weeks of traveling, while others you must have to make it work. Check out our list of the best RV gadgets for 2019 that we feel we could not travel full time without! These items are the best RV accessories you must have right away. They are must haves for RV camping of any kind, either full-time RVing or weekend camping. 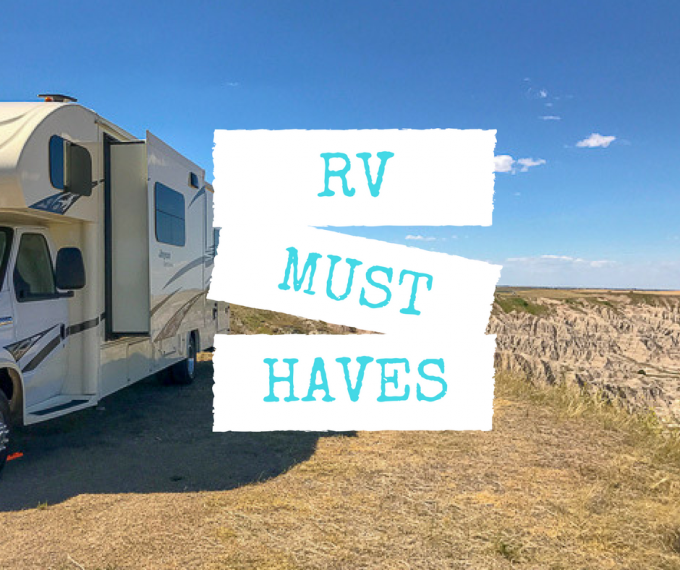 So, if you're planning to take your RV out for the first time, be sure to shop for these RV must haves for newbies and seasoned travelers! Be sure to have a clean and ready to use drinking hose ready to hook up to your fresh water tank. We learned a simple tip to connect the two ends while traveling so that nothing climbs up into the hose when it's not in use! 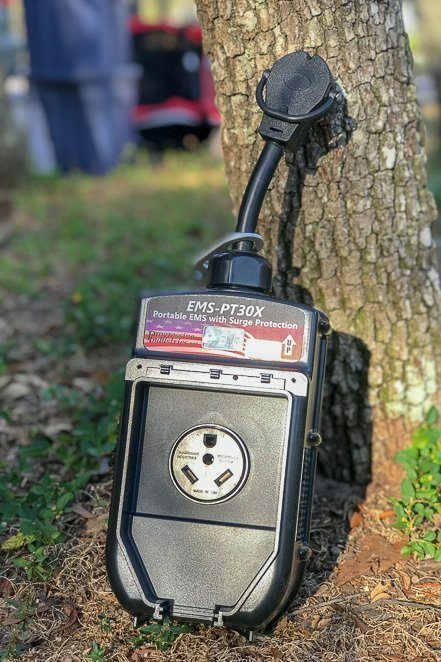 The EMS component of this surge protector protects your RV from over and under voltage by automatically shutting off your power to save your RV electrical system. This is one of the top must have RV accessories!! Do NOT go without one of these. If you have an RV that needs 50 Amp then this is the surge protector that we recommend. Again, this a one of top must have camper accessories. Sewer hoses are RV items you just NEED. We recommend getting 15 to 20 feet of sewer hose, as some connections can be a bit of a stretch. The Camco brand has done well for us. It's gross, I know. Yet, having a clear elbow is really helpful when dumping the tanks so that you can see that it's all done. 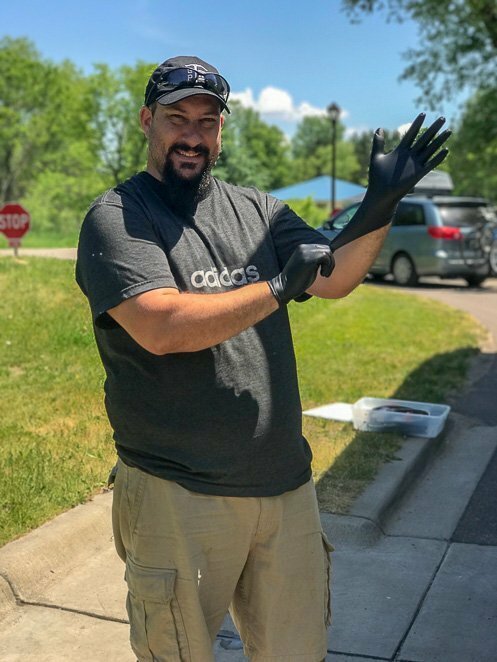 Please buy some disposable gloves...and use them when touching any sewer hose or connections! 🙂 We use ours each time we dump the gray or black tank. We are always sure to wear gloves when dumping the tanks. Weather you have a camper trailer, pop-up trailer, fifth wheel, or motorhome, these leveling blocks come in very handy and I'd say are some of the simple camper must haves listed. We use them quite often. Click here to learn our expert tips for living full-time in an RV with kids! 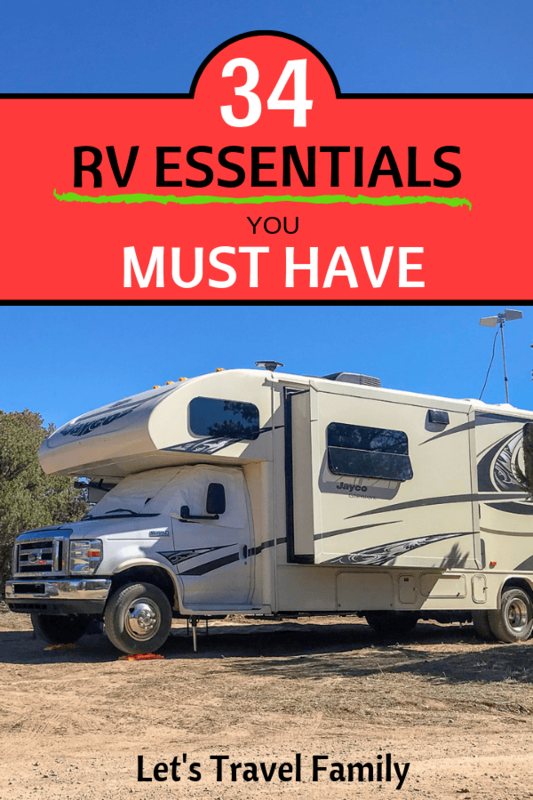 We recommend grabbing all of these rv must haves before you travel in your RV. You could make it a day or two without the following camping must haves, but we would not suggest it. Only if you are tight on money, you may be able to wait. But do NOT wait too long for some of these camping accessories! If you don't have an onboard generator like we do, then this is the highest ranking portable generator available and one of the top rv must have accessories for boondocking. Click here to view the latest price on the WEN 56200i Super Quiet 2000-Watt Portable Inverter Generator. 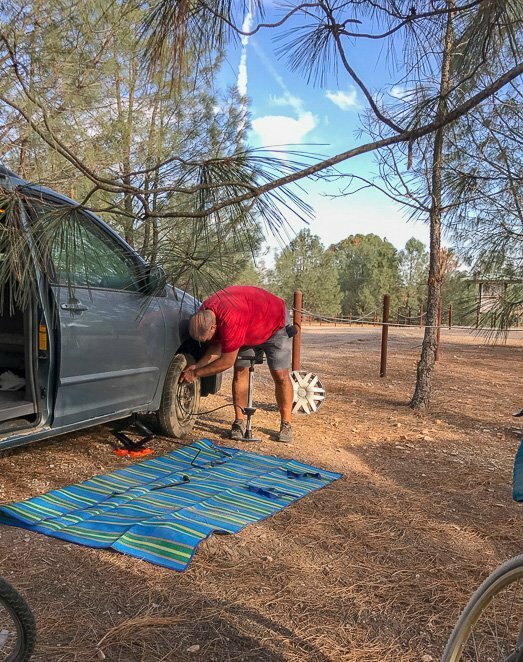 We started out without carrying an air compressor, until we had our first flat tire. Now we have one with us at all times and check the tires in the motorhome and our minivan before each travel day. Don't be like us! Be sure to always have an air compressor while traveling. We bought our air compressor the day after we had this flat tire up the side of secluded mountain. We drive in two separate vehicles, so these Two-Way radios come in very handy. Especially when we have been in the mountains or areas with no cellular service so that we could not call each other on our phones even if we wanted to. We have heard great things about driving with the use of an RV GPS. What a great RV must have gadget to own! This is one of those RV must haves for newbies that would make a great gift! 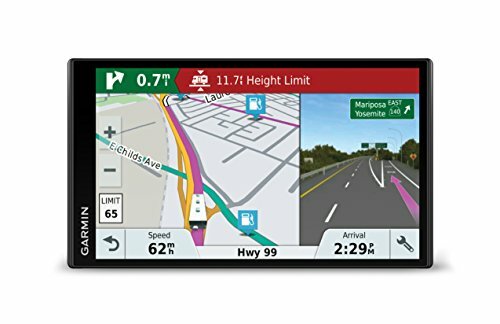 Click here to view the latest price on the Garmin RV 770 NA LMT-S. The shower head in your RV is not worth keeping. We bought and changed ours before we even used the RV. This one has worked out well for us so far. 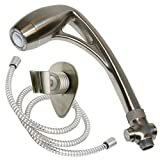 ​Click here to add one of these high pressure, yet water conservation shower head to your list now! RV mattresses are usually pretty hard and many people replace them quickly. We needed a queen short mattress that would not overheat us and was comfortable. This mattress has worked great for us! A water pressure regulator makes sure that the pressure isn't too high where it can do damage to the pipes in your RV. We use one at every campground. It's one of these essential RV accessories you should add to your list. We didn't start with this, but bought it quickly after we began to travel more. We use it quite often when the campsite is not very level. It's one of those essentials for RV living. 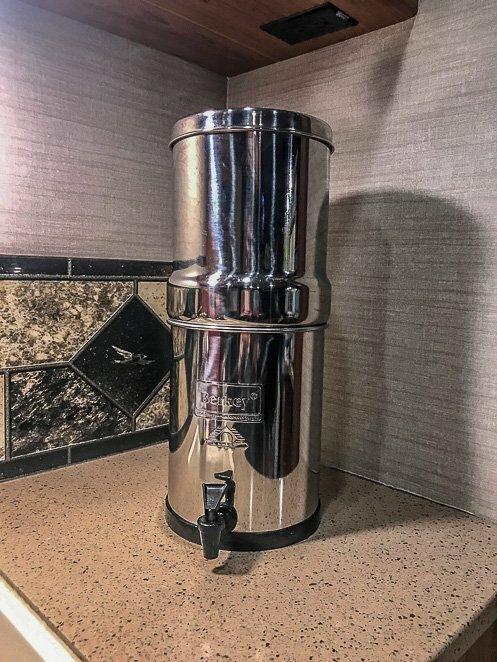 Many RV's come with an inline water filter. If yours did not, we highly recommend purchasing one of these. The water at campgrounds is not usually filtered. We have an RV that requires 30 amp service. If you have an RV that requires 50 amp then you will need the 30 to 50 amp adapter at some campgrounds. We needed this particular gage to read the second tires on the duly of our Motorhome. You'll want to have a tire pressure gage to check all tires regularly to avoid a blow out! We highly recommend having a laundry bag that is portable. This bag with straps to put over your back is the most ideal! Click here to view the latest price on the Premium Plus Quality Laundry Bag with 2 Strong Shoulder Straps - Large Size 36x24"
Here is our list of RV appliances and other rv must have items for your kitchen! If you plan to spend some time cooking in your RV, then we highly recommend purchasing these RV kitchen accessories and items. Meal preparation is much easier with our Instant Pot! I use it daily! We cook dried beans in under 1 hour without soaking, stew, roasts, soups, rice, etc. I recommend it to everyone I talk to! We use our cast iron skillet daily and store it inside our oven. Our eggs taste so much better cooked in it. This is one of those rv camping must haves because you can use it over a fire too! Best purchase that we've made yet! We drink a lot of water, so we needed to be sure that we didn't have to buy bottled water all the time. 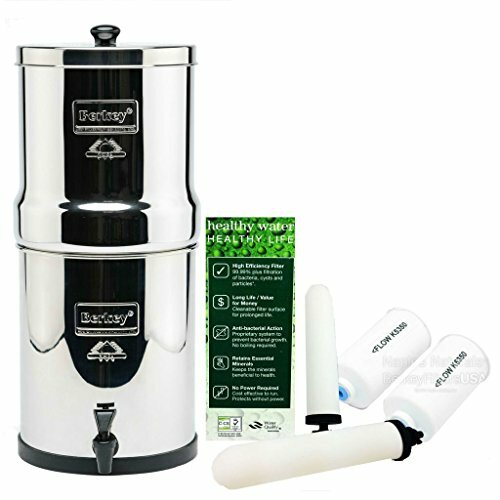 The Travel Berkey filters out ALL the bad bacteria, viruses and puts my mind at ease. We have an immersion blender like this one and use it often in place of a food processor. It works great and is much smaller and lighter than a food processor. We have owned our Breville Espresso Maker for over 7 years and it's still going strong! It makes amazing espresso, which is a good thing for the parents living in the RV ;). A good set of sharp knives is right up with as one of the top RV accessories for most campers. Now, having covers for your knives is a bonus and rates it in my list as one of those cool RV accessories. Click here to read our ultimate list of RV Kitchen Accessories. These outdoor camping items and fun RV accessories are those that we highly recommend and enjoy. We're often asked about the must have camping gear and gadgets. Take a look at the list and see if there's any camping gadget on here that you may not have thought of! Our friends have one of these and we just loved it! The kids play in it, its durable, and packs up very easy. We are ordering one next week! Many campgrounds do not allow wood burning fires. Either due to the close proximity to fellow RVers, city regulations, or if you are out west during the dry summer and fire season. This comes is handy in those instances and our friends would rank it as one of their best travel trailer accessories. We love our Cuisinart grill. No only does it store easily in a Rubbermaid bin for travel, but it allows us to cook outside too! Grills are definitely must have RV camping accessories that you want to consider bringing along with you! This table is amazing! It adjusts to be the right hight for the kids to eat at outside while sitting lower to the ground. It also functions as a work table that we stack on a second table or on top of our bed to hold our laptops on as a work station! These chairs are great for around the fire or at the beach, making them some of the best RV gear. We love multi-functional items. They have storage on the back and straps to carry them! 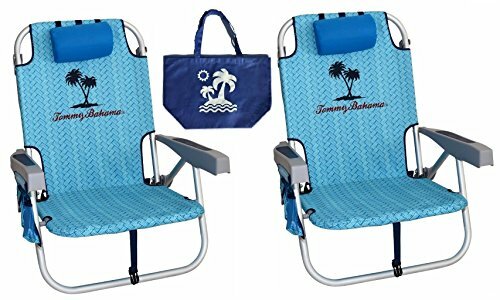 Click here to view the latest price on the 2 Tommy Bahama Backpack Beach Chairs/ Light Blue + 1 Medium Tote Bag. A good set of grilling utensils are an RV must have camping item. If you don't already have some, grab a set now! This bike rack has worked great carrying 2 adult's bikes and 3 children's bikes. We looked into many racks before choosing this rack based on the reviews and it has really held up great. This is the best bike rack for our family, holding 5 bikes on the hitch of our van. If your plan is to travel full time in an RV, then you might want to stay connected to the internet on a regular basis. 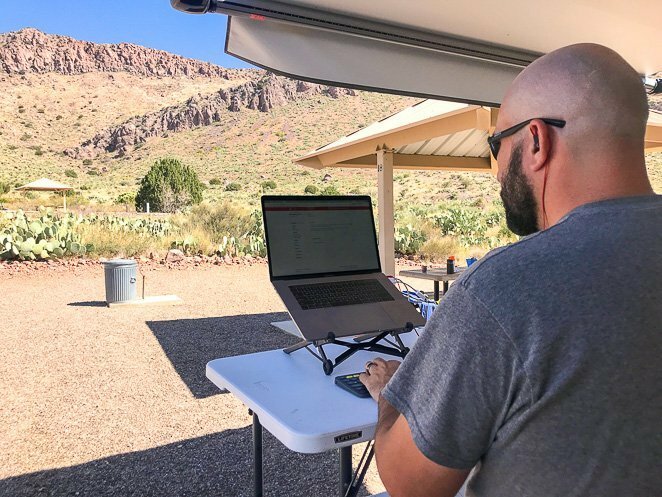 We don't recommend depending on campground wifi connections, as they are often very unreliable. Cellular internet is your best bet, and in order to have a great connection to stream videos or even connect on Facebook, you will need these must haves for rv living. Install this in your RV to boost cellular signal for hot spots and cell phones. We could not have worked online in many places out West without our We-Boost. We highly recommend investing in a We-Boost if you need to work online like we do! This was a game changer for our posture while working on our laptops. As soon as we discovered this laptop stand, bought it, and began standing to work, shoulder and back pain went away. It folds up small and has a carrying case too. We use the folding table and laptop stand regularly while working on the road. You WILL use your battery pack to charge cell phones or run laptops while away from access to power. It is a must have item. We have also found it very helpful when we are boondocking! Connect this to your hot spot to increase the range, allowing you to pick up signal. I use this in the van to help boost signal while driving. My Favorite Gift for RVers! This RV Logbook is such an inexpensive, thoughtful, and useful gift for any RVer! Weather you are looking for must have RV gadgets or must haves for campers, this is a great find. This RV Logbook is such a great gift idea. We actually wrote an entire review here for you to check out. Click here to learn more about the Ultimate RV Logbook. What items did we miss? Is there something that you cannot imagine being without, while traveling in an RV? Leave a comment below and let us know, as we are always adding to our RV Must Haves list. Do NOT make the same mistakes that we did when planning to travel in an RV. I highly recommend getting as much information as YOU can to make your travel experience a great one. 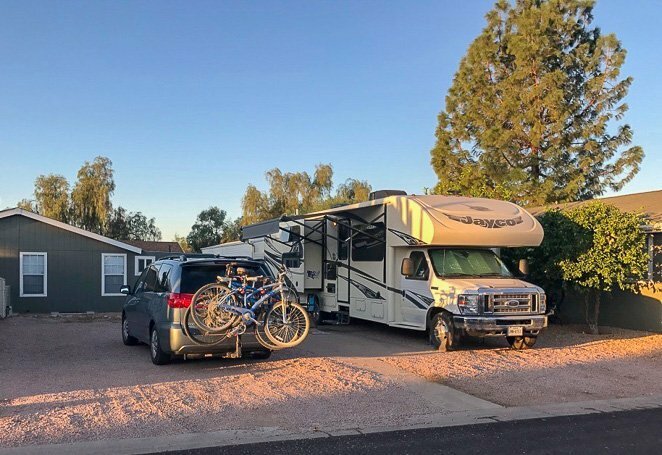 Read these top tips for planning and MAKING a road trip happen with YOUR family or these tips for getting started a full-time RV living family. Or, if you are looking for a more depth training and learning experience, I HIGHLY recommend taking this course online. What About Money On the Road? Our family of 6 travels full time in our Class C RV motorhome. Yet, we are NOT rich....not even close. In order to afford this exciting lifestyle we have to work and earn money as we travel. Click here to read our ultimate post on how to earn money while traveling! Starting our travel blog has been one of the great money making decisions we made. Learn more on how to start your own travel blog here. Or, if you want to learn how you can make money teaching English online then read this. Yes, Tony and I both work to bring in money. 🙂 I teach English online and run our Family Travel Blog while Tony works as a Digital Nomad for a great company doing IT 'stuff' remotely. Beyond working, there is a bit more to living a digital nomad lifestyle. 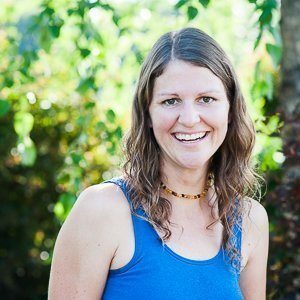 Click here to learn how our family lives as a digital nomad family.